The team at the end of a successful clean up. 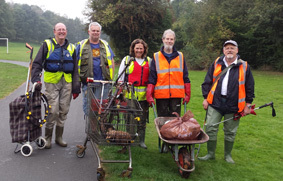 This was another successful clean up along and in the river. 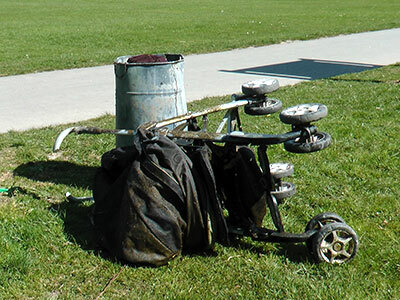 There were 6 volunteers who collected 3 bags and about 0.08 metric tonnes of other rubbish, including a pedal car, shopping trolley, car wheel and tire and a bike. Observations of a dog walker! The goosanders are back, five of them. Assume they are the ‘babies’ from this year. Well done to the Council as not only do they now empty the bins in Trehafren Park but they clear up the scattered litter, too. Keep hearing a pweep, pweep, of a Bullfinch(?) but have not seen it. There are two owls around, though, that carry on a nightly conversation. Lots of buzzards, too, and flying quite low. So much for my hard work litter picking on Wednesday this last week. Today, I could have picked up another bagful to jon the three I already have. Is it because there are not enough bins or are folks that lazy? Sue Newham is putting my name forward to be a Councillor, so I might be able to tackle the problem through that. Unbelievable – what makes them do it? I really don’t understand what makes them do it. This morning I took a walk up the Trehafren path, looking for some Giant Hogweed that had been reported to us. Lying in the long grass at the edge of the path, I spotted the seat of a bamboo chair which looked rather familiar. 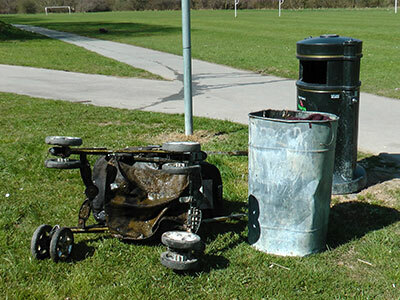 Walking on a little further, I came accross a Supermarket Trolley and quickly realized that these were the items that I had pulled out of the river on the 4th of this month and both had been left by the rubbish bin for collection. (See earlier post). The trolley has now been thrown down a steep bank into thick undergrowth and will remain an eyesore for many months to come. On my walk back home, I saw 2 Council workers loading their lorry with a large mattress and a settee, which had both been fly-tipped on Trehafren field. 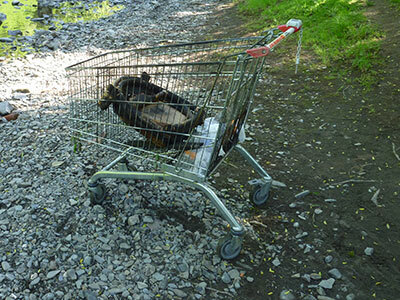 Found another supermarket trolley, plus the seat of a broken chair in the river at Trehafren over the weekend, along with a load of picnic rubbish that was left on a ‘beach’ at the side of the river. 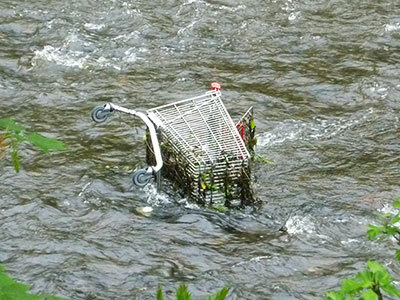 I’m not sure if this was the trolley that was at Vaynor a few weeks ago, but I have now dragged it out of the river and left it for the Council to dispose of. With the river being very low, I took a hoe with me at the weekend and attempted to eradicate as much Hogweed and Japanese Knotweed as I could find, between the Halfpenny Bridge and the end of Trehafren. By standing on the exposed ‘beaches’, I was able to get at some very large Hogweeds that would have been difficult to reach from on the bank itself and in all I managed to remove about 25/30 plants of varying sizes and 2 small clumps of Knotweed as well. It’s surprising how plants can be missed when they are in the undergrowth on the very edge of the river bank. Encouragingly, I came across a lady from Trehafren – (not our new member) – who had done a little bit of litter picking and perhaps she can inspire more people to do the same. I also managed to pull a chunk of iron out of the river which looked like the support from one of the Council bins. Disappointingly however, the Hogweed is still infesting the Mochdre Brook area and we will need to have another go at it, after the Carnival event is out of the way and before the river starts to fill up again. Hi folks – this just shows what we are up against, in spite of the fantastic work carried out by the RSC Team last week! (I’ve included OS map refs where available). Most of the carrier bags of rubbish which were at the original location have been thrown down the bank, with some of them ending up in the river. The pile of tins were created and left by 3 youths fishing at Trehafren last weekend. There were more tins than this, but most of them have been kicked into the river. 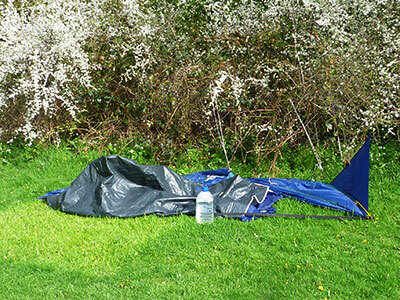 This tent was pitched in Vaynor playing field when we went to clear the Giant Hogweed. My best bet is that it will probably end up in the river. 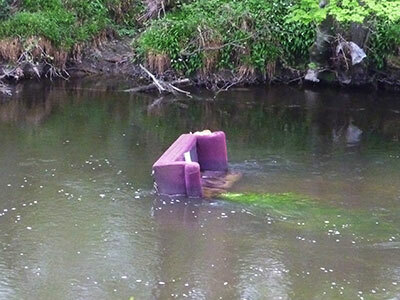 Since the planned cleanup at the Halfpenny Bridge had been postponed, I decided to tackle the rubbish in the river at Trehafren and managed to retrieve a burnt out litter bin, child’s buggy and a large settee cushion from the river, as shown in the photos below. Annoyingly, at the spot where the buggy was found, there were numerous tin cans and other rubbish littering the river bed and I have had to leave them there for the time being. Thanks to Sue Newham, who is arranging for the Council to remove this rubbish before it once again ends up in the river! On the plus side however, I did meet a lady from Trehafren who was interested in helping with litter picking in the area and I will be contacting her again to persue this. Perhaps she could be helpful in finding other people in the Trehafren area who would like to join the RSC. 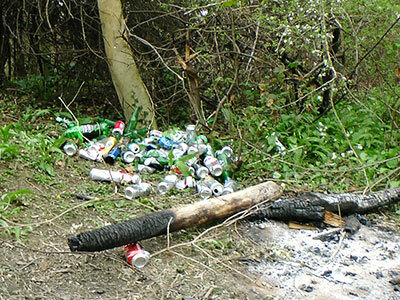 I’m feeling very angry regarding the increasing volume of litter, which is building up on the river walk at the back of Trehafren. It’s become a real dumping ground and, given the slope down to the river, that is where most of this rubbish will eventually end up. Might there be some sort of a collaborative project between the RSC and Keep Wales Tidy or even the Council to try and tidy up this eyesore. I realize that a lot of people consider this path to be just a dirt track, but it does constitute the official public footpath for the river walk. 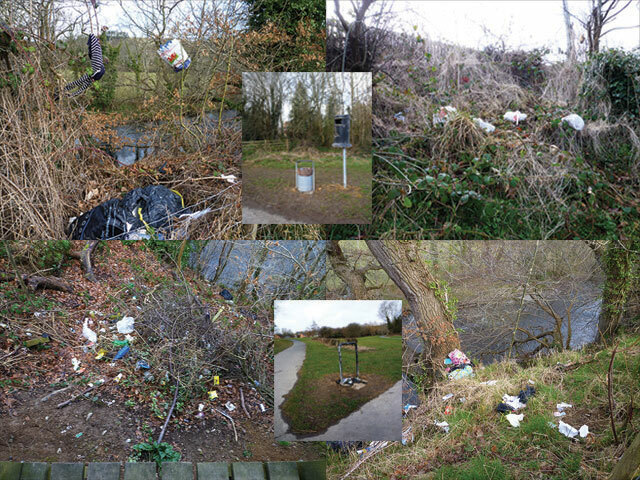 I created the collage below, to give you some idea of the scale of the problem and the vandalism that goes on regarding the litter bins in that area. Note the burnt out one in Vaynor which has been replaced no end of times. As a follow up to the above, I have today submitted – (under my name and not the RSC) – a report to the County Council regarding the fly-tipping and they will hopefully investigate the matter further. I will keep you informed on any developments.